Search Technologies, the leading IT services firm specializing in the design and implementation of enterprise search and search-enabled big data applications, announced today that it has been named to KMWorld’s annual list of 100 Companies that Matter in Knowledge Management for the 9th year in a row. This exclusive list is compiled by knowledge management practitioners, theorists, analysts, vendors, and customers. “We are honored to be recognized by KMWorld for our contributions and commitment to the knowledge management industry,” said Kamran Khan, CEO of Search Technologies. “To be named to this list for the ninth year in a row further validates our dedication to delivering the best search and big data services, solutions and technologies to our more than 700 customers around the globe,” he added. 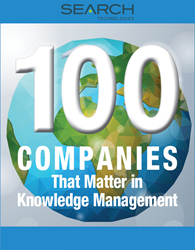 “Being named to our list of 100 Companies That Matter in Knowledge Management is a prestigious designation because it represents the best in innovation, creativity and functionality,” says KMWorld Editor Sandra Haimila. “The 100 Companies offer solutions designed to help customers find what they need whenever and wherever they need it … and what they need is the ability to access, analyze and share crucial knowledge,” she added. Headquartered in Herndon, Virginia, Search Technologies has offices in the U.S., UK, Germany, Czech Republic, and in Central America. Search Technologies’ customers include EMC Corporation, Adecco Group, U.S. National Archives, and the European Union Publishing Office. Search Technologies is an IT services firm specializing in the design, implementation, and management of enterprise search and big data applications. We make it our business to ensure that our customers achieve the desired business insight and impact from their information retrieval and analysis initiatives. Currently, we serve more than 700 customers around the globe.